THE REV. FRANK MacDONALD, D.D. THE REV. LOUIS J. VELTE, D.D. Church History "The Baptists, in the fall of 1854, began a series of monthly religious services in Chester, which were held in the old Court House for four years, Rev. Wm. Wilder officiating. Early in the spring of 1858, John P. Crozer, Esq., donated a lot of ground on the corner of Penn and Second streets, on which, during the summer of the same year, Benjamin Gartside erected a chapel for the use of the Baptists, at a cost of $1100, which building, in the rear of the present church edifice, is now occupied as an infant Sunday School. This chapel was formally opened for religious services in August, 1858, and from that time preaching was regularly held every Sabbath afternoon by Rev. W. Wilder, of Upland, and Rev. Miller Jones, of Marcus Hook. Here the infant congregation worshipped until the 24th of September, 1863, when the chapel was recognized as the First Baptist Church of Chester. The membership at that date consisted of 21 persons, who had been mostly dismissed by letters from the Upland Baptist Church. Immediately after the recognition, an effort was made to secure a permanent pastor, and in Jan., 1865, Rev. J. Newton Brown, D. D., was called to supply the pulpit for three months, and continued to preach for five months, when, on the 1st of June, Rev. Levis G. Beck became the first regular pastor of the church and continued in that capacity for nearly two years, when he resigned his charge to accept the appointment of Secretary of the Pennsylvania Baptist General Association. It was during this time that the present church edifice was completed, at a cost of $16,000. It is a brick structure, 90 by 46 feet. On the lower floor, above the level of the street, is the lecture room and Sunday School, and in the rear, the pastors study and a Bible class room. The auditorium is in the second story, and is beautifully furnished. The wall and ceiling are tastefully painted in oil colors, and a fine organ placed in the gallery at a cost of $2,000. This church is claimed, in its ventilating facilities, to be superior to all other public buildings in Chester, and will seat comfortably 600 persons. After the resignation of Mr. Beck, the church was dependent on supplies for the pulpit until Nov., 1866, when the Rev. A. F. Shanafelt, the present pastor, was called. In March following he entered upon his pastoral duties. A number of prominent Baptists immediately purchased a lot of ground adjoining the church, and a parsonage was erected thereon by the liberality of Benjamin Gartside, Esq., at a cost of over $4,000, which was occupied by the pastor in December, 1867. The church is in a flourishing condition, and has now over 250 members." In 1975 the church building and manse were listed for sale for $250,000.00. The following history of the First Baptist Church of Chester, PA was written in 1988 (author unknown) for the celebration of the 125th Anniversary Dinner on 8 October 1988. At that time the church bore the name of Middletown Baptist Church, 28 South Middletown Road, Media, PA 19063, the earlier church building having been sold to Ranges Temple Church of God in Christ in February 1976, as recounted below. The beginning of the church dates back to the autumn of 1854 when Rev. William Wilder, pastor of the Upland Baptist Church, began conducting regular monthly services in the old Court House on Market Street, Chester continuing until August 1858. In that year a piece of ground on the corner of Second and Penn Streets was generously given by John P. Crozer of Upland for the purpose of erecting a lecture room and meeting house, which was erected thereon by Benjamin Gartside at a cost of $1,100.00. Meetings were held therein on every Lord's Day afternoon, with weekly prayer meetings on Thursday evenings. A Sunday School of eighty scholars was started and for its use, a good library was procured. Frequently during this period the establishment of a regular Baptist Church was the subject of prayer and conversation among those immediately interested, but due to financial stringencies, nothing came of this until May of 1863 when a meeting was held to provide opportunity for an expression of sentiment on the subject. Opinion was unanimously in favor of organizing a gospel church. On the fifteenth day of the following September, the church was established by the adoption of a Declaration of Faith and a Church Covenant. On that day twenty-one brethren and sisters most of whom had been dismissed by letter from the Upland Baptist Church were organized into a church. The twenty-one names, as recorded, are as follows: Benj. Gartside, Wm. Hart, Marie Hart, Edwin P. Kirk, George Derbyshire, Mary A Derbyshire, John Gelston, Sarah Gelston, Joseph Newill, Elizabeth Lane, Alfred Mancell, Lydia Mancell, Jonathan Grant, Ann Grant, David T. Price, Wm. Curry, Elizabeth James, Mrs. Harriet Mouseley, Mary Ann Pickering, Park Lane, Elizabeth Newill. Invitations having been sent to the other Baptist Churches of Philadelphia and vicinity, most of them sent delegates to a meeting on September 24th at which, forming a council, these churches formally recognized and extended a cordial welcome to the new church. On October 7, 1863 it was admitted to membership in the Philadelphia Baptist Association. The following expression of sentiment was formally accepted: Believing that our Spiritual improvement and the religious welfare of this community would be promoted by the organization of a regular Baptist Church in this place, we do now therefore, for the accomplishment of this object, after mature deliberation and earnest prayer for divine guidance - solemnly, in the presence of God, unite together in the mutual covenant to maintain public worship, the preaching of the Blessed Gospel of the Son of God, and for the performance of all other duties devolving upon a Gospel Church, under a Declaration of Faith, (as recorded), a Church Covenant and the following name, First Baptist Church of Chester. During the pastorate of Rev. Beck the church building at Second and Penn Streets was completed at a cost of $16,000.00. During the period from 1870-75 the parsonage was completed at a cost of $6,000.00, while the main church was renovated and painted and the organ was installed at a cost of $2,000.00. In 1873 on the motion of Deacon Newill, this church united with Trinity Methodist and Trinity Lutheran Churches in a Thanksgiving Service, with an agreement that the Pastors preach in turn, in successive years. The following year the Second Presbyterian Church was included also. This was the beginning of a custom that continued for many years. The Mite Society was organized March 7, 1877 with a membership of 23. During its existence of more than half a century, its members kept the parsonage in repair and contributed other services that meant much to the church. In the early autumn of 1892, Mr. Jefferson Dix and Mr. W. H. J. Parker, students of Crozer Theological Seminary, opened a Sunday School on East Third Street in what was then derisively called "Happy Valley." With teaching and personal service to God, the school grew and flourished. Help came to these men in the form of noble women from the First Baptist Church at 2nd and Penn Streets. Needing more help, after a conference with Rev. Woodward, the mission appeared before the church and according to the Church Minutes of May 31, 1893, asked for our help. Then was organized the First Baptist Mission Sunday School as it was known and constituted. In another year, they moved to Morton Avenue between Seventh and Eighth Streets. The Mission had an effective ministry to the east side of our city, was a great training school for our Young People and a blessed means of grace and upbuilding to the boys and girls, and families of the section. After the loss of the Superintendent and Leader, Dr. Isaac Crowther, it was finally decided to disband the Mission, as of September 1, 1920. On March 25, 1923, with the monies remaining in the Treasury of the Mission, the former officers and teachers purchased furniture and presented it to the Crozer Hospital for Private Room No. 4, as a fitting memorial to Isaac Crowther, M.D. for his indefatigable efforts during his years of service for both institutions. As the City of Chester grew, it became apparent that better work could be done if the church were moved to a more central location. In 1892, during the pastorate of Rev. S. S. Woodward, the lot at the corner of Seventh and Fulton Streets was purchased and a new church building, with parsonage, was erected at a cost of about $36,000.00. On August 11, 1894 the cornerstone of the new church was laid. The contents of the metal box, set inside the stone contained the following: a brief history of the Church, a list of Church Officers, a list of the officers, teachers and scholars of the Sunday School, a list of the members of the Young People's Baptist Union and its officers, names of the contributors to the purchase of the lot, a copy of the Church Manual, a copy of the Chester Times of June eleventh containing the account of the breaking of ground, copies of the Chester Times and Evening News containing the accounts of the cornerstone laying, a copy of the Examiner of August ninth, a copy of the Philadelphia Ledger of August eleventh, a Bible, a photograph of the lot as when purchased, a photograph of the building ready for the cornerstone, another showing the first joists laid, a snapshot of some of the men engaged in the construction work, and a photograph of Benjamin Gartside. A copy of the Delaware County Advocate and an issue of the Prohibitionist were included by request, also some coins. The simple inscription on the stone is "1894." Mr. Samuel Crozer gave very liberally toward the purchase of the lot and building. Rev. J. M. T. Childrey became Pastor in 1900 and during his pastorate, the mortgage of the church was paid off May fifteenth, 1904. Impressive services marked the occasion. In the files of the church is a letter dated November 27, 1903 received from Samuel A Crozer, whereby he offers to contribute to the First Baptist Church the sum of $3,500.00 if other parties raise $3,500.00 thus cancelling the church indebtedness of $7,000.00. The goal having been reached, the mortgage was burned. The four remaining original members, Mrs. Jonathan Grant, Jonathan Grant, Mrs. Harriet Mouseley and Deacon D.T. Price, each holding a lighted taper, touched each corner of mortgage paper, which had been placed on a silver plate surrounded by smilax and ferns, which burned slowly then a high blaze for a few seconds, which was a sight never seen by many before and one long to be remembered. Thursday evening May 19th, 1904 was the social evening of our freedom from church mortgage. The Church and Sunday School room were beautifully decorated, and pastors from various city churches were the speakers. On Thursday, January 5, 1905 a number of the ladies of the First Baptist Church met at the home of Mrs. Ella Dietrich to hear a talk on foreign Missions given by the Missionary Society. It was regularly moved and seconded that a Women's Union Missionary Society be organized. Miss Jones was elected President. With Rev. Frank MacDonald as pastor, the church celebrated its 50th Anniversary, also the 18th Anniversary of the dedication of the church building at Seventh and Fulton Streets. During the pastorate of Dr. James Maxwell, $2,000.00 was expended on the organ making it now a three manual organ. Dr Maxwell was one of the founders of Eastern Baptist Theological Seminary, of which Eastern College was an outgrowth. He resigned from the pastorate to become professor of English Bible at the Seminary, a post he held at the time of his passing in 1948. The pastorate of Rev. Samuel D. Ringrose began in April 1927 continuing until January 1930. Rev. Louis I. Velte came to this church in May 1930, in the strength and vigor of his early ministry; with unbounded vigor of body and mind, buoyant enthusiasm for the work of the Lord and an intense love for youth. During the pastorate of Rev. Velte, the 75th Anniversary of the church was observed with appropriate services for one week. The church organ was completely remodeled at this time. The Happy Hour at First Baptist was a 'first' in Chester. Under the direction of Rev. Velte children from the entire area came every Friday night for one hour, heard a Bible Story, joined in the hymn singing and saw a travelogue, then received a 'taffy' all for the sum of 5 cents This was carried on later by a number of ministers throughout the county. In January of 1944, Rev. E. Kenneth Snyder of the Immanuel Baptist Church of Dorchester, Massachusetts came to us as our pastor. Under his pastorate the social room was renovated at a cost of $1,800.00 From its original strength of twenty~one, First Church had grown to a membership of 595 and during these years had contributed over $110,000.00 to missionary enterprises. Sunday, November 7, 1948 started a week of celebrating our 85th Anniversary of the First Baptist Church. In September, 1949 The Rev. Alpha M. Finch became the fourteenth pastor of the First Baptist Church. He came from the Green Ridge Baptist Church of Scranton, where he served seven years. Sunday, September 25, 1955 marked the completion of the first major new construction of the building since the Church was established on Seventh and Fulton Streets. The population of Chester had greatly increased and our members realized the need of larger and better facilities for the Sunday School and other activities of the church The prayers and hopes, and aspirations for adequate educational equipment were finally crystalized when the decision was reached to launch a campaign to raise funds for the needed improvements. The improvements included a remodeled junior assembly room with classrooms, a new nursery, a new beginners department, new rest rooms and a new Church Parlor. The men of the church tore down the old baptistry and installed a stainless steel baptistry. The kitchen was completely remodeled and an automatic dishwasher installed. The cost of all the improvements was approximately $80,000.00. From 1960- 1974, the church held special Sunday evening Lenten services. These services, with several of the country's outstanding preachers, often exceeded an attendance of 400 persons a night. Through the years, a number of America's outstanding preachers have spoken from the First Baptist pulpit. Among them have been Dr. Edward L.R. Elson, President Eisenhower's Minister; Dr. Norman W. Paullin, Professor at Eastern Baptist Theological Seminary; Dr Daniel A. Poling, Editor of the Christian Herald; Dr. Edward H. Pruden, President Truman's Minister, Dr. Ralph W. Sockman, Minister Emeritus of Christ Church, New York City, and Dr D.Reginald Thomas, Preacher on Bible Study Hour radio program heard on NBC. The 100th Anniversary of the Church was celebrated during the pastorate of Rev Alpha M. Finch. This Anniversary celebration in 1963 was highlighted with the burning of a $36,870.00 mortgage which completed the encumbrance on the $80,000.00 church improvement project begun in July, 1954. This took place on October 20, 1963. The day of celebration was also highlighted with a historical pageant entitled "This Is Your Life, First Baptist Church of Chester" which was written and directed by Mrs. Ruth Wilson. Rev. Finch wrote a Second Century Resolution for the congregation which was adopted on October 9, 1963. The church budget nearly doubled during the pastorate of Rev Finch. Two Sunday morning worship services were conducted and various programs of outreach and visitation were implemented. Rev. Finch resigned as of July I, 1967 having served the congregation longer than any other previous pastor. The Rev. Dr Thorwald W Bender, professor of Theology at the Eastern Baptist Theological Seminary, accepted the call as interim pastor of the congregation in July, 1967 A new set of church bylaws were adopted and the congregation also voted to return to a single worship service on Sunday mornings. Dr. Bender gave the church strong spiritual leadership as interim pastor and resigned in April 1969. The church unanimously approved the calling of the Rev Raymond A Heist to become its pastor. Rev. Heist, the former Town and Country Director of the Pennsylvania Baptist Convention was installed as pastor on June 8, 1969. Rev. and Mrs. Heist purchased their own home and the congregation approved the rental of the parsonage to the Penn Cultural Center. Following a fire at the Chester High School, the church offered the use of its facilities for school band practice and other events. In 1971 the renovation of the church tower was completed at a cost of $9,439.00. The pressure of economics and building maintenance, along with the scattering of the congregation to the suburbs, eventually led to the sale of the church building to Range's Temple Church of God in Christ in February 1976. During that month, the congregation voted to move to the Williamson Trade School located on Route 352, Media, Pennsylvania for Sunday worship services. 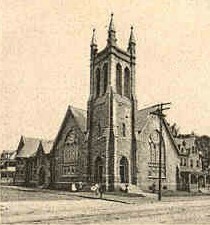 Business meetings and family night programs were held at the Second Presbyterian Church, now known as the Aston Presbyterian Church. What became known as the "wilderness years" lasted three and one-half years, until the Visions Committee ultimately recommended that a four acre tract of land located at 28 S. Middletown Road in Middletown Township, Media, Pennsylvania be purchased. Settlement on this property, known as the Wilson property, took place on October 3, 1978. A $65,000.00 mortgage was secured to help with the erection and furnishing of a new church building. Groundbreaking took place on October 8, 1978 and the church elected to be its own general contractor. The cornerstone was laid on October 7, 1979 and special dedication services were held on that day, as well as on October 14 under the theme "We Retain Our Roots But We Grow New Fruits" The name of the church was legally adopted by the congregation as the Middletown Baptist Church on August 18, 1980. A new organ was purchased during Rev. Heist's pastorate: James Brown served as youth minister, Eleanor Lupinacci (formerly Sister Teresita) had a musical ministry, and the Rev. Faith E. Spence began service as an assistant pastor. Rev. Heist served the church during a very critical phase of its ministry. He greatly encouraged and aided the move of the congregation to the present site. The congregation regretfully accepted his resignation in October, 1980 as he accepted the call to pastor the Central Baptist Church of Williamsport, Pennsylvania. Rev. Faith E. Spence was enlisted as the interim pastor, having already served the church in various capacities, and having previously served as minister of music and associate pastor of the Royersford Baptist Church. New hymnals were purchased in May, 1981 and under the leadership of the Rev. Spence a strong ministry of visitation, prayer, and Bible Study took place. Her strong sense of organization and spiritual ministry made for a smooth transition when the congregation extended a call to the Rev. Manfred von Harten in April, 1982. He began his ministry on May 9, 1982 having previously served the Chaffee Community Baptist Church of Chaffee, New York. Rev. von Harten is a graduate of Eastern College and the Eastern Baptist Theological Seminary. During Rev. von Harten's ministry a new church covenant was adopted and amendments to the by-laws were added to provide for a Board of Missions and a Pastoral Relations Committee. A mortgage-burning celebration took place on October 17, 1982 fulfilling the encumbrance on the church building erected in 1978. In 1983 the congregation celebrated its 120th Anniversary with a special banquet on October 22, and a special worship service on October 23 with the Dr. D. George Vanderlip, the James A.Maxwell, professor of Biblical Theology at the Eastern Baptist Theological Seminary, as a guest speaker. On Sunday, June 24, 1983 a special service was held in honor of Jane Birtwell Smeeton who celebrated her fiftieth year as church organist. Several workshops were held throughout 1984 and 1985 to consider enlarging the church facilities to better serve the needs of the Sunday School, the choir, and the church staff. A building committee was appointed and a financial campaign undertaken to raise the funds needed to alleviate the new encumbrance of $120,000 for the new addition. Two new wings of the church which included three new Sunday School rooms, a choir room, library, and a secretary's and pastor's office were completed in March, 1986. A special service of dedication was held on April 13, 1986. The encumbrance from this building project was satisfied on October 22, 1987. Many gifts, legacies, and memorials have been given to the church throughout its history and these have been greatly appreciated and all are recorded. The Middletown Baptist Church is associated with the American Baptist Churches of Pennsylvania and Delaware, the American Baptist Churches/USA and a member of the Riverside Baptist Association, and now celebrates its 125th year of ministry in 1988. The most important part of the history of this church lies deeper than the material things that can be seen and valued. The true nature of the Lord's work, through the members of the church during the past years and for future years, cannot be measured in dollars and cents nor by the building itself. The church consists of persons who have been converted to our Lord and Saviour, Jesus Christ; who are constantly in mission to share His liberating and reconciling love; and so it is the lives that have been renewed, restored, and reclaimed through God's Love and Amazing Grace in Jesus Christ that continue to validate our witness in the service of God's Kingdom. Many have sacrificed dearly of their time, talents, and gifts in the past 125 years not for their own sake, but for the sake of the Good News of God's Love in Jesus Christ taking root in the lives of others. Many have gone on to Glory and have made an indelible mark for Jesus Christ and many others have yet to make their mark. We believe that as our eyes continue to be lifted upwards to Him who is The Way, The Truth, and The Life, greater years are still to come through the ministry of the Middletown Baptist Church. "I don't know the years my grandfather worked at the church. I know he worked for about 44 years before semi-retiring, then he continued to open and close the church for various functions for some years after that. He did start working there during the depression, but what year??? His name was James A. McCune. Born in Chambersburg, PA, 8/20/84, came to Chester in 1914 as a foundry worker. Lost that job and ended up at the church. I read the article on Rev. Velte in which Happy Hour was mentioned. Every once in a while, Pop (my grandfather, that is) would have to lay down the law on some unruly kid, but for the most part they all were well behaved. Actually, most of the kids were afraid of him. Then on Saturday mornings he and I would go to the church and clean up the big Sunday School room. I would get a whole $1 for my efforts. Lot of money in those days. They sure were fun days." � 2000, 2001, 2003, 2004 John A. Bullock III.